Parents who are dedicated to their family’s well-being make sure that their children are healthy, strong and happy. When the family works as a unit to accomplish these goals, everyone benefits with regular health exams. However, when you are focusing on achieving optimal health, it is important to find a practitioner who focuses on the entire body instead of only one area for treatment. Because the health of our bodies is affected by internal and external stressors, a holistic approach is more beneficial for long term health. Family chiropractic care helps to strengthen the body’s healing process naturally, and this approach can benefit your entire family. The primary goal of chiropractic care is to correct any misalignments in the spine. Misalignments can prevent optimal health. When the vertebrae are not aligned correctly, extra pressure may be added to the spinal cord. As a result, signals that are sent from the brain to body tissues, cells and organs are disrupted. Although most people associate chiropractic care with older adults, family chiropractic care has shown to be just as effective for the health and vitality in younger adults, adolescents and young children. Younger people are often more physically active than adults. They are involved in sports and other recreational activities. These activities, which are considered normal childhood experiences, can create wear and tear in the body very early on. Regular chiropractic wellness checkups help to maintain spinal alignment, and keep your children’s bodies healthy and strong. This means that their bodies will be able to heal faster from bumps and bruises. It does not matter the different stages you and your family members are in life. A chiropractor can use natural, healing, alternative therapies to create a strong wellness foundation. When children receive this type of care early in life, they understand and learn to appreciate how critical spinal alignment is in their daily lives. Chiropractors are trained to emphasize this connection within their clients, and how misalignments can impair the communication between the brain and the nervous system. Regular family chiropractic care will prepare your children to embrace a path of wellness and better health. Preventative care can begin at any age. 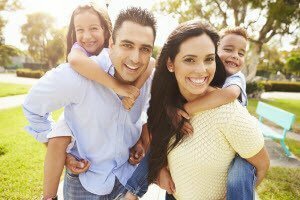 Contact Champion Chiropractic to learn how our chiropractic care services can benefit your entire family.